"I try to see myself as a sacrifice, just to show the kids they ain't the only ones who up at night." You are now chatting with thatonekid22. >> what do yoy do for work? >> do you love your wprk? >> and do you makea ton of money? >> and do you work when you want? thatonekid22 has closed his IM window. Please hold while we ask thatonekid22 if he'd like to chat with you. >> so you ever thought about another kind of job? The Image is what thatonekid22 was responding to when we connected online, the I M conversation really occurred between him and Chase. The concept to combine the image and conversation just happened. 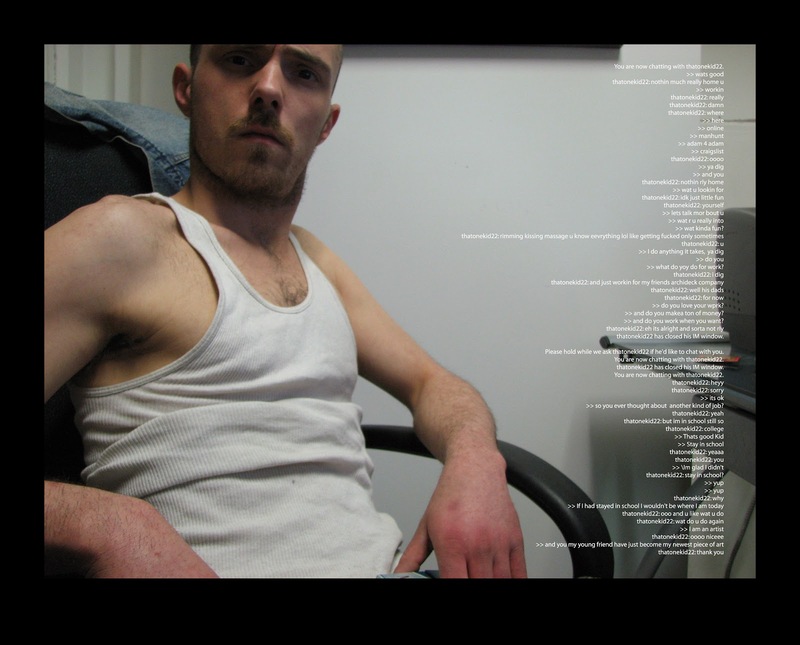 "Who I M" is a story of Chase Alias and his adventures online in Gay chatrooms. Something that has become a ubiquitous part of our community. *Names, Logos, Images, Brands and Use of All Intellectual Property, Copyrighted. Serpentine : http://www.serpentinegalleries.com/ature and art.